Last issue covered one of two vehicles that competed for a contract with the French military in the mid-80’s. This issue, we cover the winner. The VBL is manufactured by Panhard, France’s oldest surviving military manufacturer. The VBL is a rugged offroad vehicle, considered by most to be as capable offroad as a Hummer. Styled as a cross between a van and an SUV, the VBL is also capable of meeting a wide variety of tasks. Initially, it was developed to operate as a HUMINT reconnaissance vehicle and a tank hunter armed with the Milan ATGM, but it has long since been adapted to numerous other roles, including command post vehicles, APCs, air defense missile launchers, NBC recon vehicles, numerous types of ELINT reconnaissance vehicles, anti-personnel vehicles, additional types of tank hunters, and even a light wheeled "tank" outfitted with a 20mm cannon. 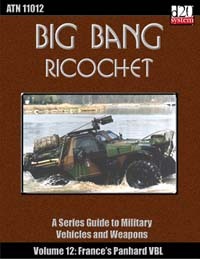 Along with detailing 18 versions of the vehicle and providing game statistics for 15 of them, this issue also provides full entries for the FLY-K Silent Grenade Launcher System, LRAC 89 Anti-Tank Rocket Launcher, and Mistral Air Defense Missile System, for a total of 24 weapons, variants and ammunition types covered. Need to catch up on your military acronyms? NBC: Nuclear, Biological & Chemical. Some use CBR (Chemical, Biological & Radiological) or ABC (Atomic, Biological & Chemical) in its place.